NOTE: THIS SITE DESCRIBES THE LAW AS OF 2009. ESPECIALLY, IT DOES NOT REFLECT THE PROPERTY LAW CHANGES OF HESSIA (2011) and NORTHRHINE_WESTFALIA (2013). Since this website went online I received numerous enquiries from hobbyists worldwide. Most of them came from US citizens and were related to the German metal detecting laws. This page was created to address this issue. For non-legal, general questions concerning metal detecting in Germany also check the FAQ. This account was written with US citizens in mind who want to travel to Germany for two or three weeks, who have never been to Germany before, and who want to do a bit of detecting before they return to the States. If you are an US citizen permanently living in Germany, a member of the US military maybe, you will already know many things described here. Also, you will be in a much better position than tourists as you have more time, more knowledge, more contacts, and you might speak German. The recommendations given are aimed to be of practical use rather than being an academic text. My answers will help you to detect as much as possible. I tried to tell you what can be done instead of what cannot. The German authorities will do the opposite. Most people want simple answers. This is understandable. Some even seem to perceive Germany as a sort of giant Disneyland metal detecting themepark. Upon arrival at the airport, they hope to be able to buy a digging permit so they can dig everything and bring it home to Texas. Unfortunately, things are not that simple. Believe me, I will keep the following as simple as possible and I will spare you many legal details. Before I started writing this article I asked myself "What should an American detectorist know about Germany if he never left the States before? What information can help him to make his stay as pleasant and successful as possible?". So I decided to write a sort of "introduction to MDing in Germany for foreigners". To give some background information rather than quoting just a few law paragraphs. Before we look at the laws we should briefly look at the societies they are imbedded in. This is not about "better" or "worse". It is about what can be done and what cannot. The societies of Germany (in fact, most European countries) and the US differ. In the US most things are more extreme. The rich are richer, the poor are more numerous and poorer, 20% of the population has no health insurance, guns are widespread in the southern states and the imprisoned part of the population is some 10 times larger. In 2007 one out of 138 citizens was jailed in the US. An amazing number without equal in the western world. In Germany and most European countries the ratio is one out of some 1200. In other words, in Germany it is some 10 times more difficult to get into jail. If you got along within the US legal system, you most likely will not have any problems at all in Germany. 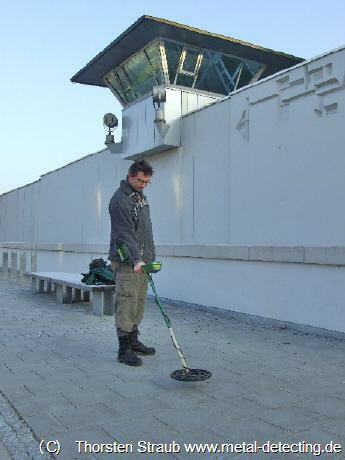 To date not a single individual was ever sent to jail in Germany because of metal detecting. Even the finders of the Star disk of Nebra did not go to jail though they tried to hide this discovery - worth millions of Euro - from the rightful (at least: formal) owner, the state of Sachsen-Anhalt. Given these facts no detectorist needs to fear the German laws if he applies a minimum of common sense. There are strict gun laws in Germany. Virtually nobody you will meet on the street carries a gun. This also means that landowners gunning down trespassers are unheard of. So you can detect most places in Germany without such fears. Also, "No trespassing" and "private property" signs are very rare. In total, considering the law and the find prospects Germany is a very good country for knowledgeable detectorists. What is the perception of the US in Germany? Traditionally, the US had a very good reputation in Germany because of the post WW2 years and the C.A.R.E. program. And because of the proud tradition of personal initiative and achievement so highly rated in the US. This also applies to the world of treasure hunting. Much more US names appear in the TH hall of fame than from any other single country. With the exception of the Frenchman Franck Goddio all top notch shipwreck hunters - Kip Wagner, Mel Fisher, Bob Marx or Tommy Thompson - are or were US citizens. The best TH literature came and comes from US searcher-authors. Half a century old and still the possibly best books on land treasure hunting with the help of a metal detector were written by an US Author. The initials of his nom de plume were KvM. The worlds largest metal detector manufacturer is located in the US. So are two of the most respected TH magazines. This list could be easily continued. Back to the US reputation. Unfortunately, it suffered tremendously because of the Iraq war of 2003 and its aftermath. Reluctantly I mention this controversial topic though it is not MD related because you will do better in Germany if you are aware of these concerns, regardless whether you share them or not. This war influenced the reputation of the US in the world - and in Germany - stronger than anything else since the Vietnam war. Also in the opinions of those who normally do not care for politics. Much of this website has to do with military history. From the viewpoint of the amateur military historian I would like to conclude with the following brief remark. Most wars in US history, in vast contrast to German history, were led in a clever and, ultimately, successful way. Especially, they were not started without good reason and careful consideration. Among other things, this allowed the US to rise from a British colony to the world's leading superpower. There are few exceptions to this rule in the last 400 years and the Iraq war of 2003 is one of them. In spite of this Americans are still very much welcomed in Germany, of course. No farmer will deny you a search permit just because you are from the States. The language barrier will usually be a much bigger problem. US people often seem to think that German laws are very complicated and restrictive. While this is true in some cases, it is not true in general. In the US, I understand, searchers have to deal with city laws, county laws, state laws and federal laws, in some areas also with tribal laws. Besides dealing with the landowner. In Germany the situation is much simpler. Besides the property law (search permission and in some states find property, for the latter see below) there is mainly the monument protection law. Both laws exist independendly. The land owner's permission to dig a hill grave on his property is insufficient. You still need a permit from the monument protection authorities (see below) - which you will not get. That is why I recommend to stay away from archaeological sites. After all this intro we finally get to the laws. Owning and using a metal detector is not prohibited in Germany. Everyone can do that. That is the most important thing. The rest will be told in a short and a long version. In all countries there are laws to protect historical monuments, the so-called monument protection (MP) laws. Germany is no exception. In Germany, the MP laws are issued by the state, not by the federation. There are 16 states in Germany, so there are 16 laws. They are very similar. The main difference relates to find property. In all other states of Germany the found item automatically becomes property of the state if it is of "archaeological importance". The term is not precisely defined, so it means "if the state wants it". That is right, finder and landowner get nothing. Guess how many finds are reported in those states. The star disk of Nebra, found in Sachsen-Anhalt, is a famous example for an important find. After it was found it went through several hands. On the one hand these people tried to hide it from the authorities, on the other hand they offered the disk for sale to the same authorities. Did not work. All MP laws require a permit if you want to dig, in some cases even detect, "historically important" sites. This term, again, is only vaguely defined, leaving room for endless debates. Also because of this I cannot give you a clearer answer. MP permits cannot be bought though in some states a fee of 50 or 100 Euro applies. Only the MP authorities can give you a MP permit. Landowners, mayors, presidents of historical societies etc. cannot. How easily these permits are issued differs from state to state and depends largely on the boss of the local MP authorities. In Bavaria, for instance, no such permits are issued at all (which is illegal but that does not seem to matter). My recommendation for foreigners is not to apply for MP permits and to restrict their search to harmless areas where no such permit is needed. You can still find coins and buttons of the 1700s or 1800s on usual arable fields. Remember, you need a MP permit only for areas that have the status of a monument (though the authorities might claim otherwise). Especially stay away from hill graves and locally famous historical sites where signs tell people what used to be there. It is understandable that especially foreign people want to be 100% safe from the legal point of view but in most states this is simply not feasable unless you restrict your search to bathing beaches. It is the intention of German MP authorities to scare people off by using this tactic. All people I know usually search without MP permit. If you live in Germany and have much time you can contact your local MP authorities or historical societies and see what they think. Maybe you will even find a detecting buddy there. Some MP authorities are approachable. Most are not. For tourists without time this is not an option. Choose some field, maybe even modern (younger than 500 years) battlefields, but stay away from antique (older than 1500 years) sites. Also keep in mind that no gouvernment anywhere cherishes people from abroad who come and take away historical items to their homecountries. It is merely tolerated to a certain degree. Some MP authorities states have declared larger no-digging areas, called "digging protection areas". Check before you search that you are not in such an area. If you violate MP laws you will be fined a sum which is usually between 100 and 1500 Euro. In rare cases your detector can be confiscated. Unlike in the US your car is never confiscated. It is a minor offense, not a real crime, similar to parking your car at the wrong place but with higher fines. Fines due to MP law violations occur very rarely in German. In contrast to the US in Germany treasure finds are tax-free ! At least for Germans. Some states in former Eastern Germany, especially Brandenburg, have declared large no-detecting areas due to masses of unexploded WW2 ordnance still in the ground. Check for the boundaries of such areas if you wish to detect in these regions. Every year a few people in Germany are maimed or killed during the attempt to disarm WW2 ordnance. However, disarming is crucial, not the digging itself. Not a single case is known of a detectorist who got injured while digging ordnance. Beware when you encounter rusty cylinders. Do not move them. The small 2 cm shell duds are especially dangerous. Since their self-destruction mechanism obviously failed they are extremely sensitive. Please never try to transport them. See also WW2 firearms metal detecting finds . From my articles in US MD forums I know that many US detectorists are interested in World War 2 finds. Is it possible to bring them home to the states? Ordnance, as described above, of course must not be dug. Non-weapon finds such as helmets, insignia and id tags should be no problem. But what about found firearms? As mentioned above, usually people are not allowed to own firearms in Germany. Found WW2 firearms are legally weapons even if they are not operational any more. This might seem silly to readers from the gun-friendly US states but this is the law in Germany and most or all other European countries. So I recommend to have the find disabled by a certified gunsmith. Legally, this will transform the firearm into something everybody can own without restrictions. At the bottom of the WW2 firearm page you can see some documents I received with respect to the lawful handling of found firearms. There is also a gunsmith's receipt confirming the disabling of a gun. Whether you can bring the disabled gun into your plane you have to check with your airline or airport personnel BEFORE you attempt to check in. I do not know. The same applies for stabbing weapons such as bayonets. Unlike, for example, the countries of South or Central America there are hardly any German export regulations concerning historical items. This is one reason why serious collectors often get into contact with serious German searchers. Buying directly from the source not only avoids the margins of the middlemen. It also guarantees the authenticity of the finds which is otherwise often a huge problem for collectors and museums. Probably the alleged "ID tags of German soldiers who died in Stalingrad" in private US collections outnumber by far the German soldiers who really fought at this place. In Eastern Europe there is a whole industry faking objects for the US market. Even if the items are genuine there are sometimes ethical issues involved. Genuine ID tags from Russia are often dug from graves. This gruesome activity rose especially after the collapse of the USSR in 1989/90 and the resulting economical breakdown. In contrast, here in Bavaria 99.9% of all ID tags were discarded by soldiers who happily lived to see the end of the war. Once I found a hoard of such tags. It is sure the soldiers, mostly airmen, survived the war since I reported the tags to the authorities. Besides, the find circumstances were unsuspicious. Like in the US every squaremeter is owned by someone. It is not illegal to search areas without the permission of the landowner unless he explicitly made clear that he disapproves your search, e.g. by telling you or by fencing the land or by setting up prohibitive signs. In general, it makes no significant legal difference whether land is owned by the state, the Republic of Germany, companies or private persons. Stay away from fenced areas. 99.9% of the area in Germany is not fenced and "No trespassing" or "Private property" signs are extremely rare. There are enough forests for an entire army of detectorists available. In forests do not ask anybody for permission, just start searching. If the landowner comes (unlikely) tell him truthfully that you did not know who owned this land and that you will leave if he insists. Probably he will not insist. On open arable fields ask the landowner for permission prior to searching. They will see you anyway. Ask at the nearest farm. Either they own the land or they know who does. Remember, farmers are much more sensitive with arable land than with woodland. Arable fields produce food, woodland does not. Most farmers do not speak English. Prepare a short written note or, much better, let a German MD buddy do the talking. Of course, you won't do any damage (damaged plants, unfilled holes) and you will honor any promise you gave. Please do not violate these simple rules and do not lose the farmer's cooperation for yourself and everybody else. Metal detecting is a minority hobby in Germany. People use to look at hobbyists with friendly curiosity and it should stay that way. In my experience German farmers are friendly, much more relaxed about metal detecting than the monument protection authorities, cooperative, and in some cases even knowledgeable about the past of their property. Usually I search woodland so I don't need a permit (see above) but when I asked for a permit for arable land I was only turned down once in 10 years. This was because the farmer had made bad experiences with state archaeologists, not with detectorists. can help identifying and dating finds etc. So much to my recommendations concerning a detecting trip to Germany. Hope you found some useful information and ... maybe one day I see you in the field! Unrelated to law. Since this page is often read by US military personnel in Germany this piece of information is added. If you have access to the Grafenwöhr base this might offer you interesting detecting opportunities. This base was originally erected by Nazi Germany in WW2. To do this, the inhabitants of some 20 villages were relocated. This is unparalleled in German history. I do not know whether these ghost towns are accessible but they might be good hunting grounds.